So much of what goes into a house goes in there because that's the way things have always been done. No one ever really thinks about the inherent, inherited inefficiencies of things like sink drains. 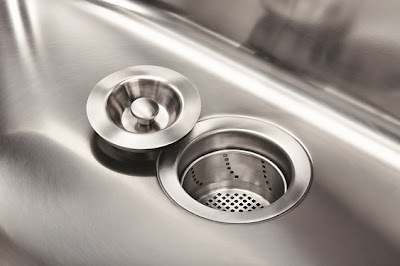 Well Blanco does think about these things and they just unveiled a new, three-piece sink drain that's pretty clever. 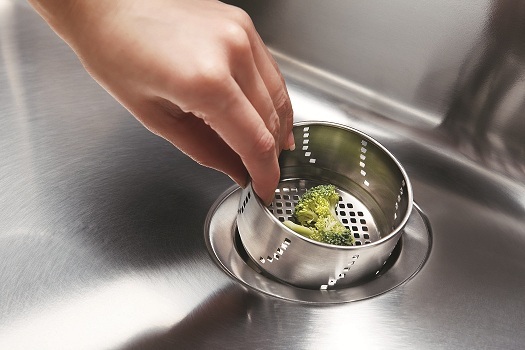 The Blanco 3-in-1 offers a deep strainer basket with engineered holes on the sides and bottom that keeps water flowing while it collects waste. An exaggerated lip makes it easy to pull up and empty without coming in contact with any of the gunk caught in the strainer. 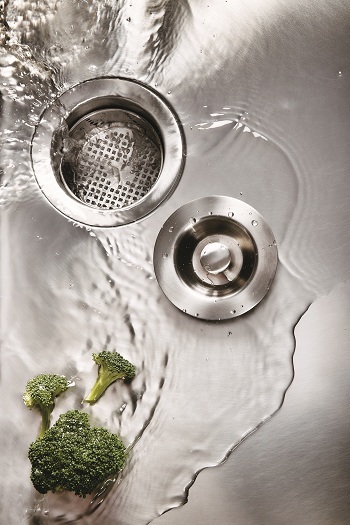 It's made from stainless steel and it's dishwasher-safe to boot. The third part of this wonder product is a one-touch, secure lid that will allow you to fill a sink with water and hold it there without having twist or turn a thing. Even better, these strainers will fit any standard new sink or retrofit into an existing sink. Meeting up with the great minds at Blanco design is but one of the reasons I'm excited to take part in a Blanco-sponsored junket to Germany next month. Thanks Blanco! You can learn more about Blanco sinks and faucets on their website. Blanco products are available worldwide. You have no idea how many of your posts I bookmark for our upcoming kitchen remodel. Wow, amazing how long it took someone to come up with something that seems so common sense. Brilliant :) I want one..
Raina: You have no idea how validated I feel from comments like that. Nim: Screw your landlord, you need to renovate your place. I think this is awesome and will definitely be recommending it in the future. See? There's always something new on the horizon. I spent more on my drain than I did on my faucet. The gentleman at the plumbing supply store pulled it out last (he had 4 or 5 styles) and said, "This isn't the one you want?" As if I was stark, raving mad (who's been talking to the plumbing supply guy?). It is the drain we all grew up with. The one that is heavy, and you twist the stopper to keep it up or to send it down to stop the water from flowing out of the sink. It's what we all grew up with and I love it. Still can't find the faucet that I want in my price range! Brizo's new faucet is beautiful. I agree with Nim. What's your price range Kathy? Be sure to enter my contest for the Brizo giveaway, you always have the charm when it comes to these things. Anyone have any idea of what the item number is on this? I was super-excited to get one: now's the time, but I cannot figure it out.